Just add one 1-dram bottle of any flavoring! 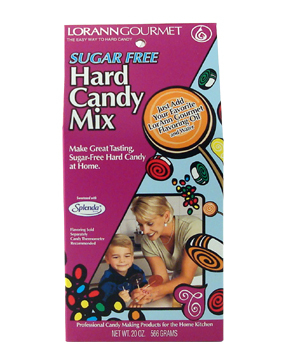 Our Sugar-Free Hard Candy Mix is made from two unique sugar replacers, Isomalt and Splenda. Combined with LorAnn's Gourmet Flavorings you can make great-tasting hard candy with half the calories of sugar. Isomalt, the primary ingredient, is exclusively made from beet sugar. It is tooth friendly and is also suitable for diabetics as it does not increase blood glucose or insulin levels. Splenda is the only non-caloric sweetener made from sugar. It tastes like sugar with no unpleasant aftertaste.